Pink Lane Jazz Co-op was delighted to be contacted by The Co-operative to help celebrate the 150th anniversary of the Co-operative Wholesale Society. 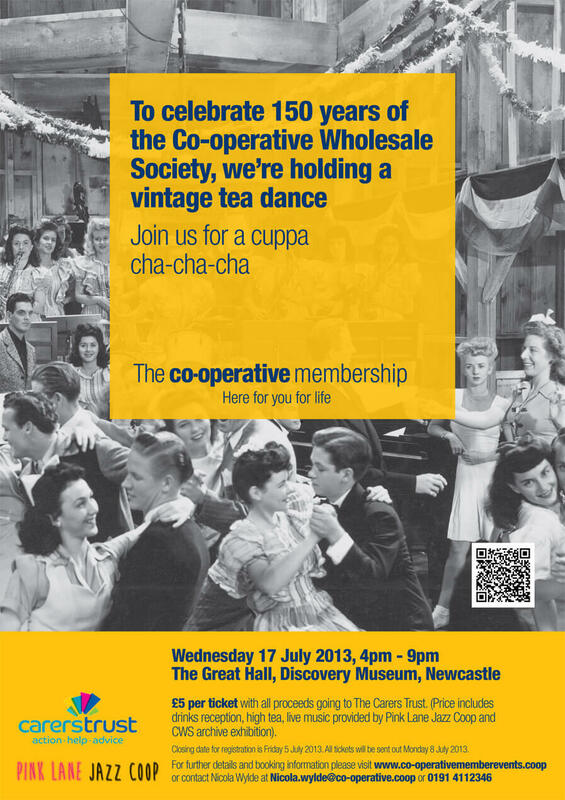 Their northern region membership team asked us to arrange the musicians for a Vintage Tea Dance to be held in the Great Hall at the Discovery Museum in Newcastle on Wednesday 17 July 2013. The event runs from 4pm to 9pm and includes music from Strictly Smokin’ Big Band and Blue Jazz Quartet and a drinks reception, high tea and a co-operative archive exhibition. Tickets are £5 with all proceeds going to The Carers Trust.